40 Days of Prayer is held each Lent in the 40 days leading up to Palm Sunday. With daily prayer gatherings coupled with weekly gatherings on Wednesdays, you’ll have the opportunity to participate in the power of prayer with others in the city around us. 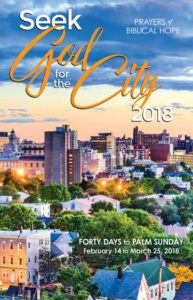 “Seek God for the City 2018” helps you pray with clarity and biblical hope for others. Prayer Guides are available at weekly gatherings or at the Good News Book Center for $2 each (or $1.50 each for groups of 10 or more). Stay connected with this weekly prayer guide, or a companion app is available for your smartphone or tablet. Multiple locations and times around Pasco and Hernando. All gatherings are come and go as needed.